It is extremely important to have a Thai and English speaking US immigration law firm based in Bangkok to work personally with your girlfriend, fiancee or wife. English speaking US based immigration lawyers are useless to your girlfriend, fiancee or wife. Only a Bangkok based firm, with American and Thai staff, can effectively care for all of your girlfriend, fiancee or wife’s needs, advise you and her as to the current procedures and atmosphere at the US Embassy in Bangkok. The US Embassy in Bangkok is where the decision will be made to issue or deny the visa. Don’t loose sight of this important fact. 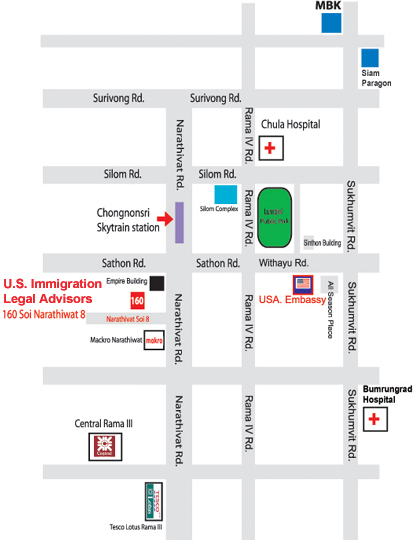 U.S. Immigration Legal Advisors has operated in Bangkok going on two decades, 10 years at our current location in Bangkok’s central business district.